IFPI, the International Federation of the Phonographic Industry, presents itself as the “voice of the recording industry worldwide.” The organization represents 1,300 record companies globally including the biggest labels in the industry. IFPI’s annual Music Consumer Insight Report delves into the way music is consumed by 16 to 64-year-olds, particularly in the ever-expanding digital marketplace. Carried out by AudienceNet between April and May 2018 and covering twenty territories accounting for 91.3% of global revenues, the research aims to understand how consumers engage with both licensed and unlicensed content. The report kicks off with the headline figure that 86% of consumers are now listening to music through on-demand streaming, with a solid 50% of 16 to 24-year-olds indicating a preference for streaming if there were only one way to listen to music. According to the research, 75% of consumers now use smartphones to access music. But while millions of global consumers are now choosing licensed services for their musical fix, large numbers are still obtaining content from unlicensed sources. The report finds that almost four out of ten consumers (38%) still obtain their content using methods that infringe copyright. In the early 2000s, the unchallenged kings of illegal music supply were the P2P networks dominated by the likes of Kazaa and LimeWire, with BitTorrent and file-hosting sites entering the party later but grabbing a huge slice of the cake. Now, however, it is largely legal services that are providing the source material for the ‘pirate’ market. 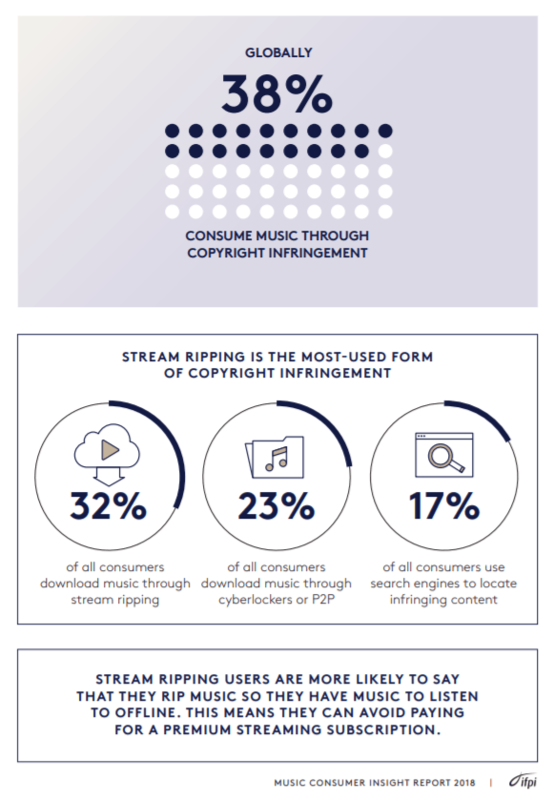 IFPI is clear: so-called ‘stream-ripping’ is now the most-used form of obtaining music online illegally, with 32% of all consumers downloading music this way. While users can head off to legal services and stream ad-supported content at will, stream-rippers use various tools to download the music instead, meaning that they don’t have to revisit to listen to the same content. “Stream-ripping users are more likely to say that they rip music so they have music to listen to offline. This means they can avoid paying for a premium streaming subscription,” IFPI notes. With a nod to successful action against sites including YouTube-MP3 and others, IFPI notes that the stream-ripping issue isn’t going away. “Record companies are taking action globally against stream ripping sites that undermine legitimate services and pay no money to those investing in and creating the music. Despite some successes, the problem persists,” its report reads. In its latest submission to the USTR, the RIAA highlighted a number of key overseas stream-ripping offenders, including Flvto.biz and 2conv.com (which are currently being sued), plus Mp3juices.cc, Convert2mp3.net, Ytmp3.cc, plus several others. Given that YouTube is now a major source of both licensed and unlicensed music (and is an unwitting key supplier of source material to the ‘pirate’ market), it’s no surprise that the so-called ‘Value Gap’ and related issues are highlighted in IFPI’s research. “[U]ser upload services are not returning fair value to the music community,” IFPI notes, adding that 35% of consumers say that a main reason for them not subscribing to a paid music service is because everything they need is already available for free on YouTube. While the music industry is determined to change legislation in order to find a way out of the ‘Value Gap’ conundrum (particularly via the now infamous Article 13 in the EU), it has other copyright-related problems to deal with too. According to the study, almost a quarter (23%) of global consumers obtain unlicensed music through either cyberlocker sites or P2P systems such as BitTorrent. Sites specializing in both delivery systems were recently reported to the USTR including Russian giant Rapidgator, Zippyshare, and Turbobit, plus torrent indexes ThePirate Bay, Torrentz2, RARBG, and 1337x. Finally, IFPI’s report notes that 17% of all consumers use search engines to find infringing content. Given that billions of takedown notices have been sent to Google to remove links to pirate music from search results, this seems like a pretty high figure. Anecdotal evidence online suggests that Google, in particular, is no longer the trove of unlicensed content links it once was. However, with initiatives like site downranking now in place at Google, it seems likely that key sources of unlicensed content will continue their trip to the outlying pages of search engine indexes, which could encourage users to test out alternatives such as DuckDuckGo. IFPI, of course, will hope the trend switches towards licensed services instead.